This book, written by the President of Compassion International, is a great reminder of just how important our interactions with other people are. In just a minute, a person's entire life can be changed for better or worse. One negative comment may ring in a child's ears until it becomes a self-fulfilling prophecy. Likewise a single bit of encouragement may be all it takes to stop a teen from taking his frustrations out on the school where he faces bullies every day. 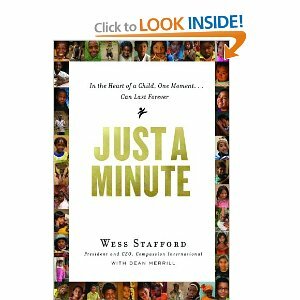 This book is full of stories of just one minute that changed actual lives. Some of the stories show how a negative comment devastated someone, while others show just how powerful a hug or a word of encouragement can be. Read the book. Be encouraged. Be inspired to influence someone for the better in just a minute. Disclaimer: I received a copy of this book in exchange for my honest review. The book will now be donated to the library where others can be inspired to change lives. Sounds like an inspiring book. Thank you for the review.